After producing and mixing songs for the whoai??i? 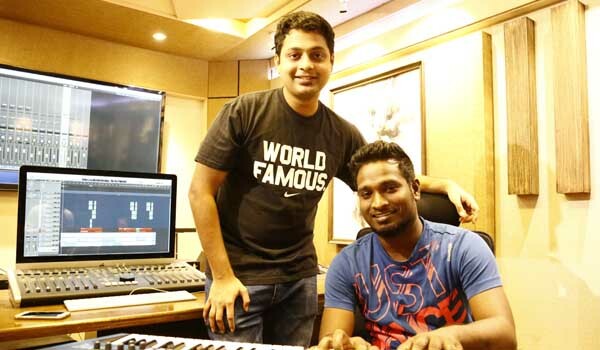 ?s who of the Tamil film industry, Vivek Siva and Mervin Solomon are basking in the success of the first single from their upcoming film Dora. Talking about the movie, Vivek says, ai?? ?After Pugazh, we received a call for a script reading. When we knew that Nayanthara was a part of it, knowing her knack of picking great stories, we just had to take it.ai??? Having made the conscious decision to pick movies where the soundtrack plays an integral part in the story, the duo are very choosy about their projects. ai?? ?Each movie expects a different essence from you. We love challenging ourselves and exploring genres and ideas weai??i? ?ve not done before. We donai??i? ?t want to keep doing similar movies or tracks even if the names are big. A typecast is no boon,ai??? adds the 25-year-old music producer and sound engineer. Working on the movieai??i? ?s album for close to six months now, the duo are all set to release the second single from the movie today. Called Vaazhavudu, reminiscent of one of actor Ajithai??i? ?s signature lines, the song traces the journey of an underdog who just wants to be left alone. ai?? ?This is Nayantharaai??i? ?s introduction song in the film and is an out-and-out commercial number,ai??? adds Vivek, who has also crooned for the song. ai?? ?Cinema is a great medium because you donai??i? ?t have a genre restriction,ai??? says Vivek as he talks about Mohini, the duoai??i? ?s second big project this year. Although a true-blue horror flick, he asks us to expect a mixed bag with something for everyone ai??i?? from a melody to a club number. The duo have also resolved to make more time for their independent music, hinting at some exciting collaborations in the coming months.